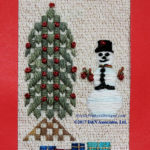 Snowman Decorating Holiday Tree is a 72- by 101-counted embroidery design. This 10-page full color booklet provides discussion of the chart accompanied by photos of the worked design. 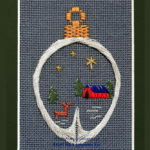 My Deer and Barn Holiday card shows a wintry evening: stars shining above a deer grazing within a treed area near a barn. My counted needlework embroidery design is presented within a 10 plus page booklet. 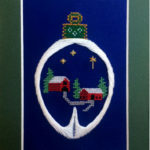 My House and Barn Holiday card shows a wintry evening: stars shining above a country home and barn. 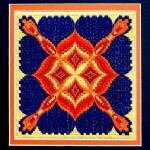 This counted needlework embroidery design is presented within a 10 plus page booklet. Copyright © 2014 D&N Associates, Ltd., NoelleFrancesDesigns.com. All Rights Reserved. The Magazine Premium Theme by bavotasan.com.